Phalaenopsis orchids, also known as moth orchids, are renowned for their spectacular blooms. But they don’t constantly bloom, going into a resting phase after they’ve finished flowering. Orchid newbies often mistake this for the death of the plant. And since they are slow growers, along with having a few peculiarities that make them quite different from other common houseplants, many people tend to just give up on their phalaenopsis plants in frustration, assuming that their orchid is done blooming and any further care is wasted on a boring plant. But a healthy phalaenopsis orchid will live for years, blooming again and again, given proper care. So if you have a orchid that appears listless or you’re having problems getting yours to rebloom, don’t give up on it just yet! This article can help by explaining exactly how to make phalaenopsis orchids rebloom and will walk you through some practical steps to encourage your orchid to enter its flowering phase. I’ll also cover common problems people experience when trying to learn how to make orchids bloom more flowers, so you can enjoy another glorious display of phalaenopsis blooms from your plant. How Often Do Phalaenopsis Orchids Bloom? The best way to make phalaenopsis orchids rebloom is to begin preparing them for the next flowering cycle as soon as they’ve finished with the previous one. Therefore, the first step for reblooming success is to understand the phalaenopsis orchid blooming cycle. In nature, phalaenopsis orchids usually blossom once a year. New flower spikes typically appear in late fall and lengthen during the wintertime, producing blooms in late winter or early spring that last for months on end. And sometimes, after the flowers fall away, a few additional blooms may emerge at the end of the spike. Once it’s done flowering, the plant goes into a resting period during which it slowly replaces the nutrients it has expended in producing flowers. This resting and vegetative growth period usually lasts for 6-9 months as the plant develops new roots and leaves before the shortening days and cooler nighttime temperatures of fall signal that it’s time to put out another burst of floral finery. So now that you know what the phalaenopsis orchid blooming cycle looks like, the next steps you can take to coax your plant to rebloom will involve providing the regular care it needs to grow healthy and strong, along with several actions you should perform at the appropriate times during the growing cycle to encourage your plant to produce those exquisite flowers that orchid lovers live for. When your orchid has finished blooming, begin fertilizing, trim back the flower spike a bit, and provide the plant with optimal conditions for vegetative growth. After one or two leaves develop, trigger blooming by having the plant experience a nightly temperature drop of about 10 °F (5.5 °C) for 2-4 weeks. When a new flower spike emerges, return the plant to its normal growing environment and stop fertilizing. Now, let’s take a closer look at each of these periods and the actions you should perform to entice an abundance of phalaenopsis blooms from your orchid. After blooming, phalaenopsis orchids will enter a period of resting and revitalizing. The duration of this for potted indoor phalaenopsis orchids varies greatly, depending on factors such as plant health, growing conditions, and whether or not it has been adapted to an artificial schedule. But ideally, this phase lasts for 6-9 months. 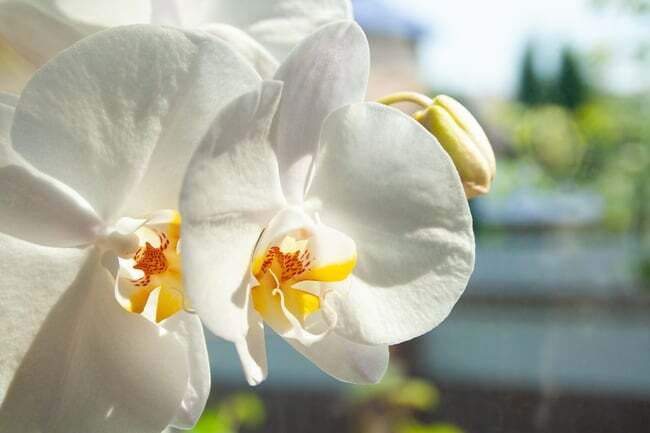 Fertilize your phalaenopsis orchid: When the blooming phase has ended, begin fertilizing your phalaenopsis with a weak solution of water-soluble orchid fertilizer. Continue fertilizing every other week during warmer months and every 3-4 weeks during colder weather, making sure you always water your orchid without fertilizing at least once between each feeding. Trim the flower spike: While it’s very tempting to remove the bare, lifeless-looking spike, it’s better for the health of the plant to leave it be. It may not look like much, but it serves as a nutrient store for your plant to draw from as it builds the energy to bloom again. Just trim away any parts that aren’t green, cutting it back to right above the third or fourth notch, or node, to encourage new growth. Phalaenopsis orchid owners often place their plant in a prominent spot in their home or office while it’s blooming to enjoy the beautiful display but then place it in a different location to provide optimal conditions for the vegetative phase. This way, you won’t be bothered by the unsightly flower spike. Provide the optimal environment for vegetative growth: The location you choose for your orchid should receive plenty of bright indirect sunlight or full-spectrum florescent light. Windows with lots of indirect sunlight are great options for orchids because they like to have warmth during the daytime and slightly cooler temperatures at night. Your orchid will also benefit from more humidity during this period. So consider using a humidifier, or place the plant on a tray filled with pebbles and water. Phalaenopsis repotting. Note that if you’ve decided that it’s time to repot your orchid, either because the growing mixture needs refreshing to ensure proper drainage and aeration or because your plant has outgrown its pot, the best time to do it is after the plant has finished blooming and new air roots have begun to emerge. I’ve written an article covering this topic here. After your orchid has grown a couple of new leaves, you can trigger it to bloom again by providing it with a temperature drop of about 10 °F (5.5 °C) at night. If it’s autumn and your plant is in a windowsill, the seasonal temperature change may be enough to signal your plant. Or, you can simulate this temperature differential in your home by simply turning your thermostat down at night. Another alternative is to set your plant outside, if you have outdoor daytime temperatures in the range of 70-85 °F (21-29 °C) accompanied by the requisite nighttime temperature drop. Phalaenopsis needs this temperature differential for about 2-4 weeks. Watch for a new flower spike to appear a couple of leaves down from the plant’s newest leaves. Through the years, as your plant grows larger and stronger, it may even produce two flower spikes at the same time, one on either side of the central plant stem! Once you see a new flower spike emerge, place your phalaenopsis orchid in its previous location and stop fertilizing it. The spike will grow and produce buds. It’s best to wait until the buds have all blossomed into flowers before placing your plant its display location, as moving the plant can cause the unopened buds to fall off. Now, just water when needed and enjoy the show, satisfied that all your care and attention has paid off! 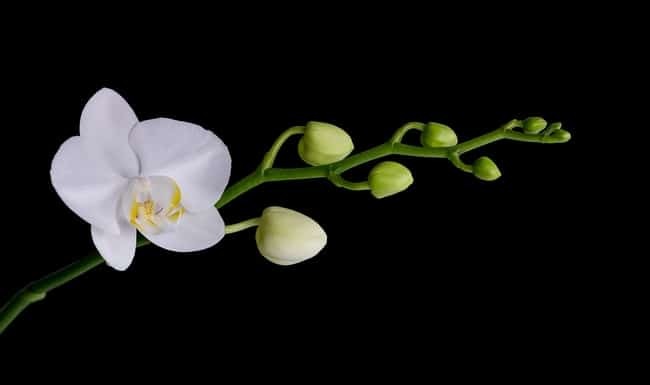 In this section, we will examine the different reasons that may be behind a phalaenopsis orchid’s failure to rebloom and offer suggestions for how to remedy the situation. If the plant is struggling because it is not having its basic needs met, it won’t have the energy required for blooming. Therefore, many of these troubleshooting issues have to do with providing good orchid care. The number one reason why phalaenopsis orchids fail to bloom is that they’re not getting enough light. The color of your plant’s leaves will tell you whether or not you are providing enough light. A healthy moth orchid will have bright green leaves, while a dark green color indicates that it needs more light. Phalaenopsis orchids love lots of bright, filtered or indirect sunlight. If you don’t have adequate natural lighting available, you may wish to consider using a full-spectrum grow light for your plant. On the flip side, too much light can also inhibit orchid blooming. Lighter green, yellowing, or red-tinted leaves are signs of sunlight that’s too intense. If this is the case, try moving the plant a little ways away from a window with direct sunlight, filtering direct sunlight with a sheer curtain, or relocating the plant to another window. Too much or too little water could prevent your orchid from reblooming, with over-watering being much more common than excessive dryness. When determining if it’s time to water your plant, always check the potting mixture.You should allow it to become mostly but not completely dry between waterings. If the potting material is not allowed to properly dry out, you risk root rot and disease that will weaken the plant and could eventually cause it to die. On the other hand, a phalaenopsis that’s too dry will try to save its leaves before expending any resources on producing blooms. Signs of too much or too little water include brown patches as well as leaves that are limp, wilted, leathery, or wrinkled. The plant’s roots will also tell you if you are watering correctly. They should always be plump and firm, with tips that remain green or magenta when they are actively growing. Although phalaenopsis orchids are light feeders, lack of food will prevent your orchid from reblooming. Be sure to feed your plant when it’s not blooming to promote the growth of healthy roots and leaves, which will be needed to sustain the plant when it is producing blooms. Use a fertilizer that’s specifically formulated for orchids, preferable a weak solution of water-soluble fertilizer with immediately bioavailable nitrogen rather than a urea-based formula that releases nutrients more slowly. Constantly moist potting mixture could be due to watering too frequently, or it could be because the potting material has broken down over time and has become so compacted that it’s not draining well anymore. If it has begun to break down and decompose, it will starve your plant roots of oxygen and nutrients in addition to harboring rot and disease. Also, if you don’t flush the potting material out between fertilizing, you could end up with a toxic buildup of mineral salts. If you notice that the potting mixture has become degraded to the point of damaging the roots, you should immediately repot your orchid in fresh growing material to save the plant. It will take at least six months for your phalaenopsis orchid to regain the strength to produce blooms after repotting. If your phalaenopsis is refusing to rebloom, it may be related to an improper balance of humidity and airflow. As previously mentioned, phalaenopsis orchids do best in higher humidity environments during the vegetative growth phase. In nature, they thrive in environments with 50-100 percent humidity, but they will adapt to levels of 50-60 percent – which is still high for the typical home. Thus, ensuring that you are providing sufficient local humidity to your plant may be the key to bringing on the blooms. But humidity can damage your plant if not accompanied by sufficient airflow. Those high-humidity natural habitats have plenty of fresh, moist air circulating freely around the plants. So make sure your orchid also has fresh air from a window or gentle circulation fan. As it turns out, typical household temperatures of 63-84 °F (17-29 °C) are perfect for phalaenopsis orchids. However, since these orchids are particularly sensitive to drafts and other rapid changes in temperature, make sure your plant is not being harmed by nearby air conditioning or heating vents or external doors. The one temperature change phalaenopsis orchids do like is slightly cooler temperatures at night – and don’t forget the all-important daytime/nighttime temperature differential of 10 F (5.5 °C) that’s needed to trigger blooming. When it comes to triggering your orchid to bloom, providing the proper temperature differential may not be enough to do the trick under certain circumstances. If you’re using artificial lighting, be sure to reduce the hours of light along with providing cooler nighttime temperatures to mimic the shortening of the days in autumn. Additionally, if you try to trigger blooming during the wrong part of the plant’s growth cycle, it won’t work. Phalaenopsis orchids need to have developed at least one or two new leaves, which provide nutrients for the production of blooms. 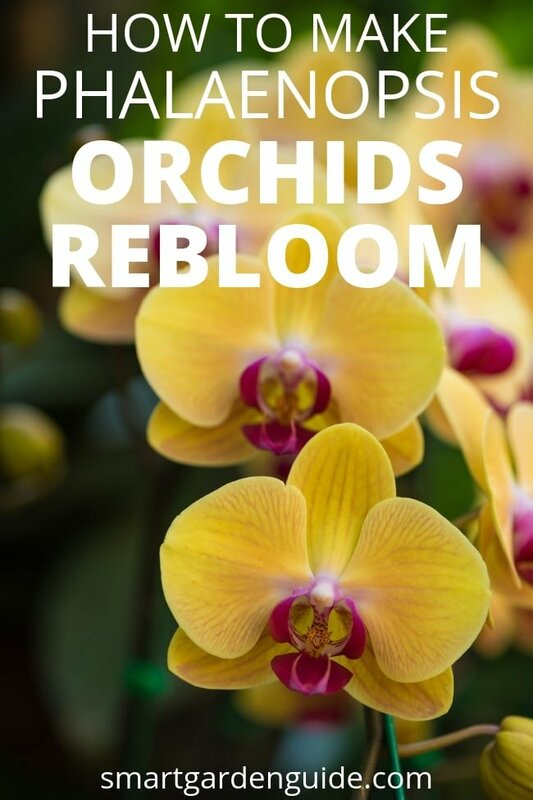 If you’d like a more visual guide to making a phalaenopsis orchid rebloom, here is an excellent video from Shirley Bovshow, which I think does a great job at teaching the essentials of how to make phalaenopsis orchids rebloom.